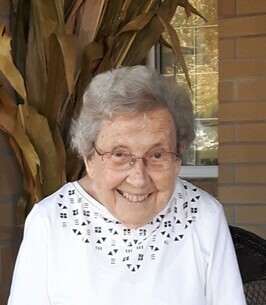 Shirley Viel Service Details - Whitby, Ontario | Barnes Memorial Funeral Home Ltd.
Shirley Grace in her 90th year, reunited with her beloved Rob (Robert Garnet 2002) on November 3, 2018. Dear mother of Pamela (Charles Unhola 2017) and Cynthia (Peter Wilson). Beloved Nanny of Gregory (Heather), Elizabeth (Jayson Pohl) and Abigail (Aaron Merlin). Great Nanny to Gavynn, Cassidy and Taryn. Predeceased by her great grandson Lincoln. A Celebration of Life Reception will be held at Barnes Memorial Funeral Home, 5295 Thickson Rd. N. Whitby on Thursday November 8th. Friends and family are invited to visit anytime between 3:00 and 5:00 p.m. In memory of Shirley memorial donations to Lakeridge Health Foundation would be appreciated. We are deeply saddened to hear of Great-Nannys passing. She was so kind, always smiling, and laughing endlessly. Her absence will be felt and she will be deeply missed. Our thoughts are with the family during this difficult time. Cindy and family,, With our deepest sympathy at the loss of your mother. Anne and Jim Simpson .